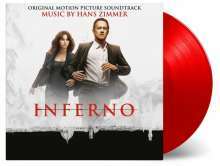 Der Artikel Filmmusik: Inferno (Hans Zimmer) (180g) (Limited-Numbered-Edition) (Red Vinyl) wurde in den Warenkorb gelegt. Inferno is based on the 2013 novel of the same name by Dan Brown. The film is the sequel to The Da Vinci Code and Angels & Demons, and stars Tom Hanks, reprising his role as Robert Langdon, alongside Felicity Jones, Omar Sy, Sidse Babett Knudsen, Ben Foster and Irrfan Khan. The score is composed by Grammy, Golden Globe, BAFTA, Academy Award Winner Hans Zimmer (Interstellar, Inception, Pirates Of The Caribbean, Lion King).